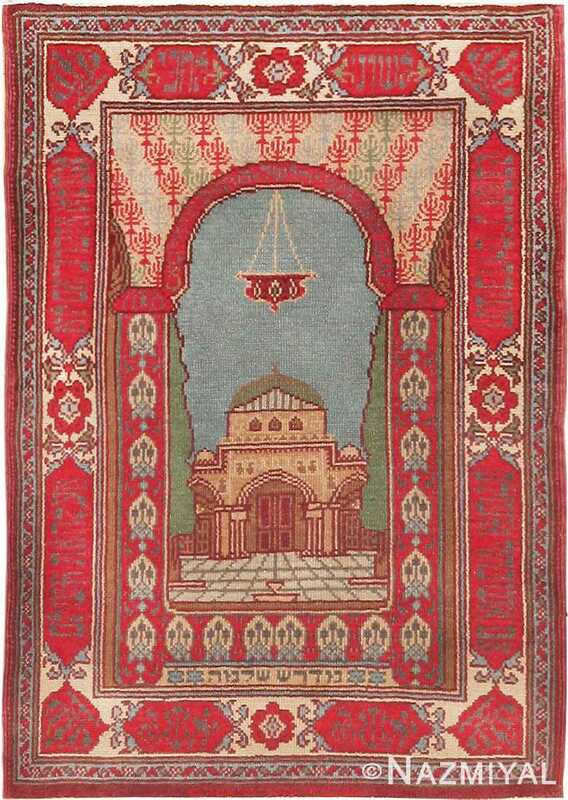 A Beautiful And Artistic Antique Judaica Pictorial Temple Of Solomon Israeli Marbediah Rug, Country of Origin / Rug Type: Antique Israeli Rugs, Circa Date: 1st Quarter of the 20th Century – This beautiful antique Israeli Marbediah rug represents a piece of Jewish history. 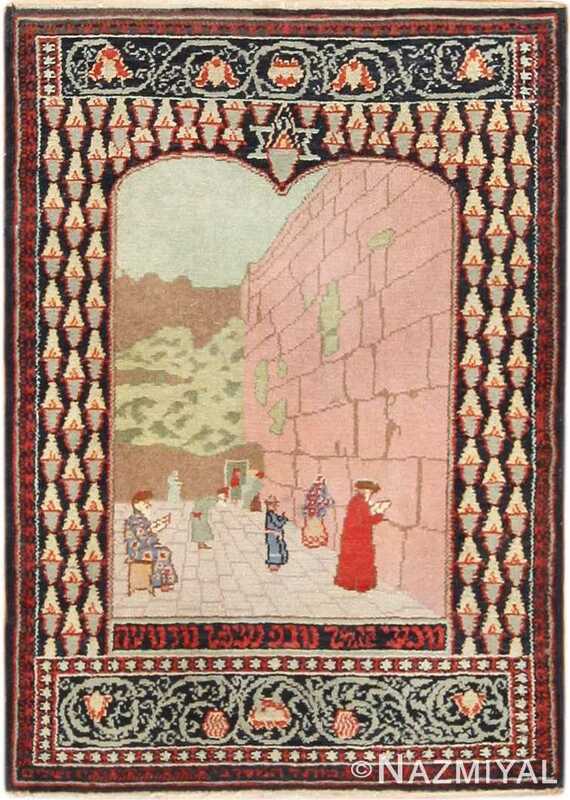 It was produced in the first quarter of the 20th century and depicts the temple of Solomon. 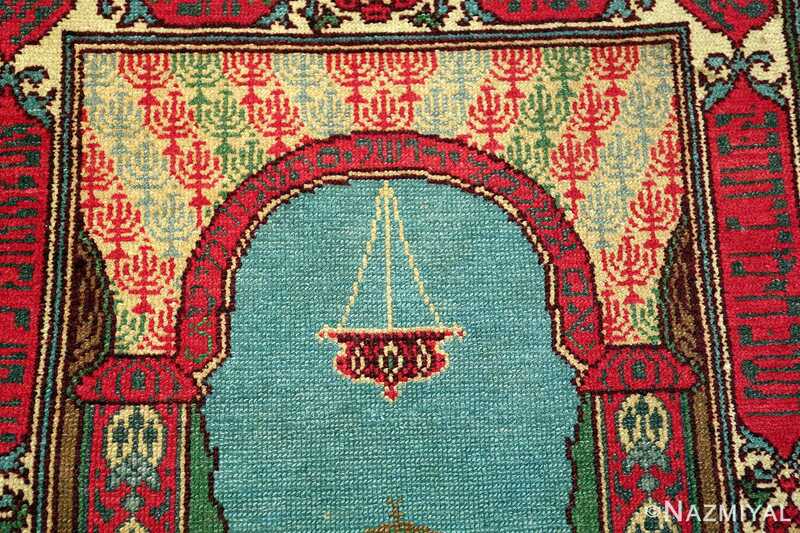 This Judaica rug pays homage to the importance of the ancient biblical Temple of Solomon in Jewish traditions. The pictorial rug is small, making it perfect as an accent piece, or as a ceremonial element. 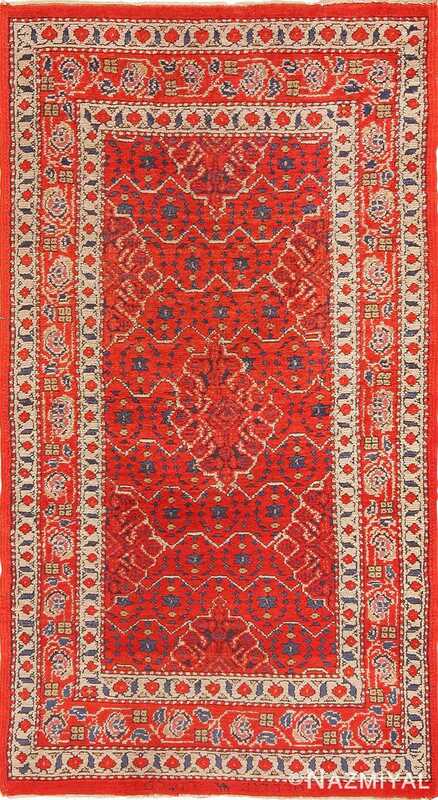 This is truly a collector rug for both its beauty and its historical value. 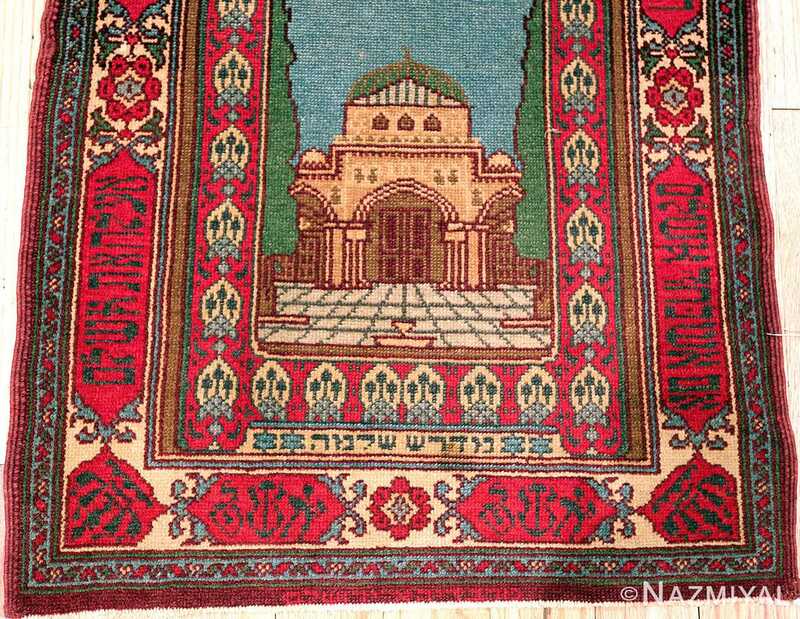 The beautiful red, blue, green, and ivory of the Israeli rug are balanced throughout the design to draw attention to the focus on Solomon’s Temple. 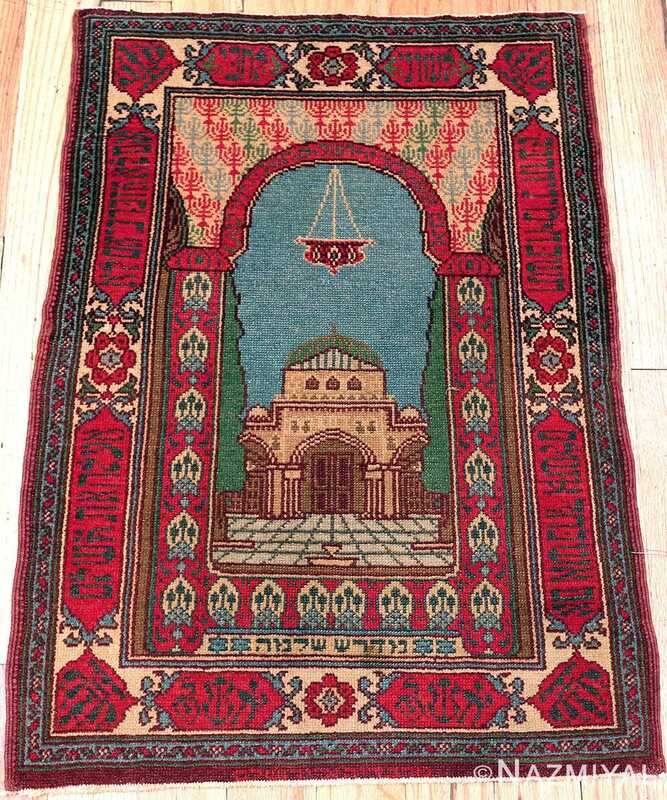 The artist of this small rug created a sense of perspective through the use of color and line to make it appear as if you are viewing the temple from a distance, perhaps gazing at it from a window. 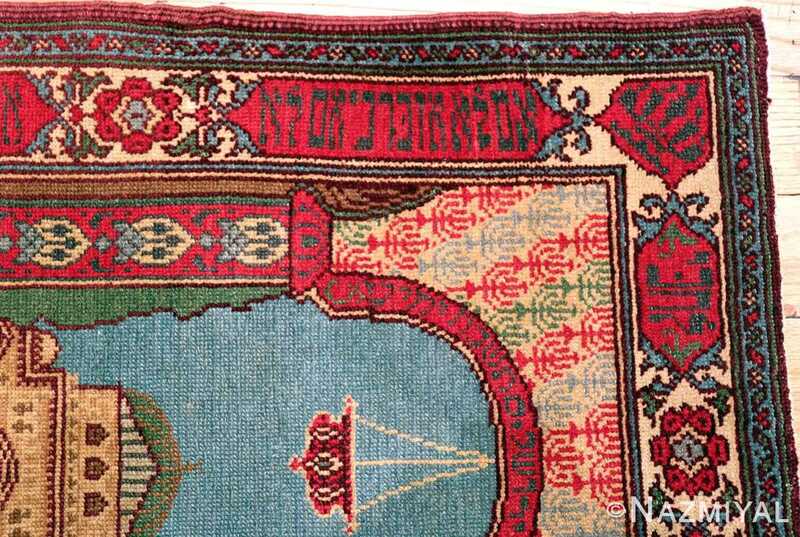 The artist achieved this by using lighter colors in the main border to bring out this element, with darker more subdued colors in the center of the design. This gives it the sense that this element in the distance. The artist further enhances this effect using what artists term as a vanishing point and horizon line. It is clear that the artist intended to make it look as if you are viewing Solomon’s Temple from the distance. The artist divided the field into three different areas, each with its own sense of symmetry and organization. The outer main border has both vertical and horizontal symmetry. 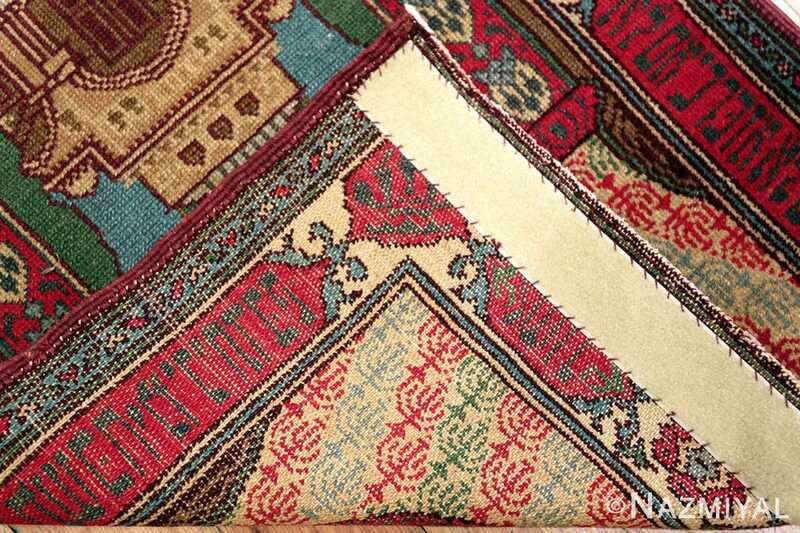 However, the middle and central design only have vertical symmetry. 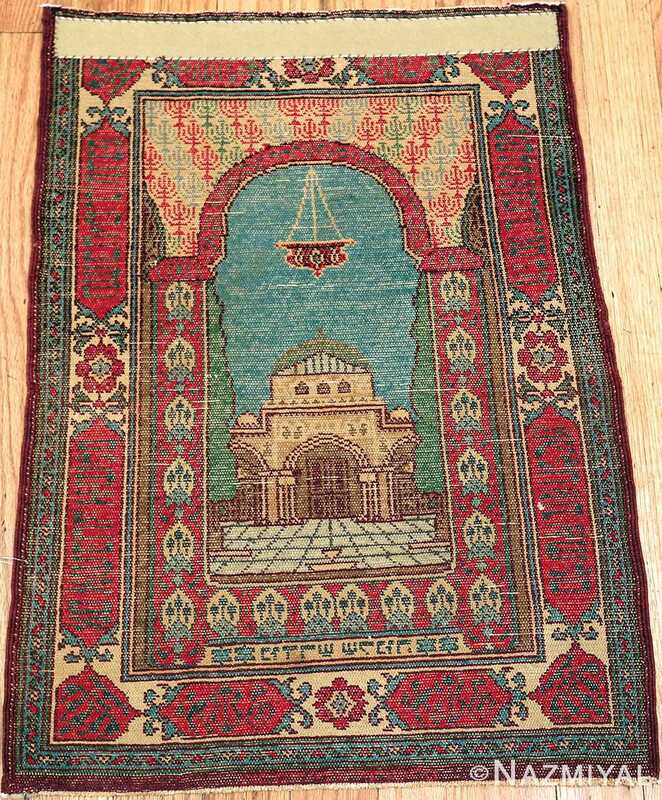 This adds a sense of height and proportion that go beyond the physical size of the Israeli Temple of Solomon antique rug. As one can see, the deliberate choices of the artist are apparent in this antique Temple of Solomon Israeli Marbediah rug. 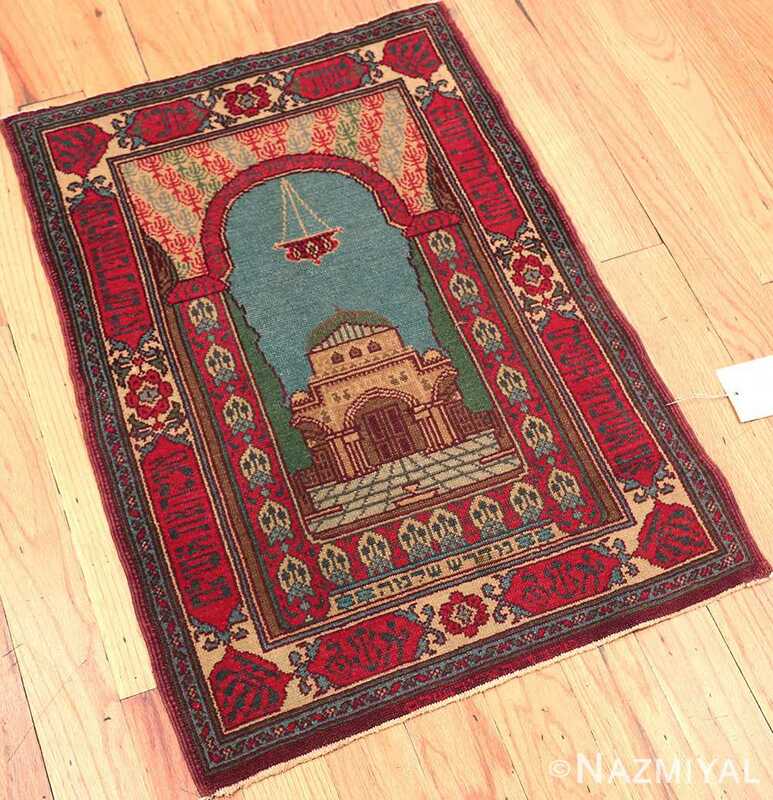 This not only makes it a beautiful element to any room design, but also an important piece from an artistic perspective as well. 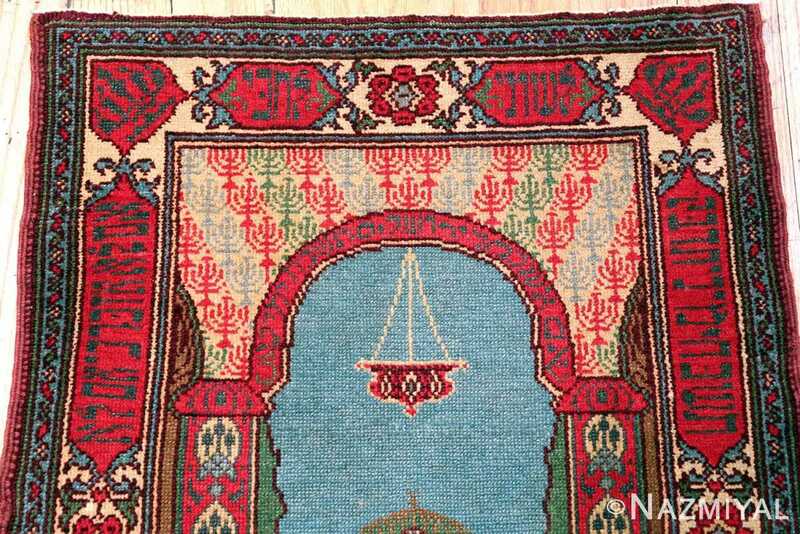 The complexity of the design makes this Marbediah rug a beautiful addition to any room design and a wide variety of styles. 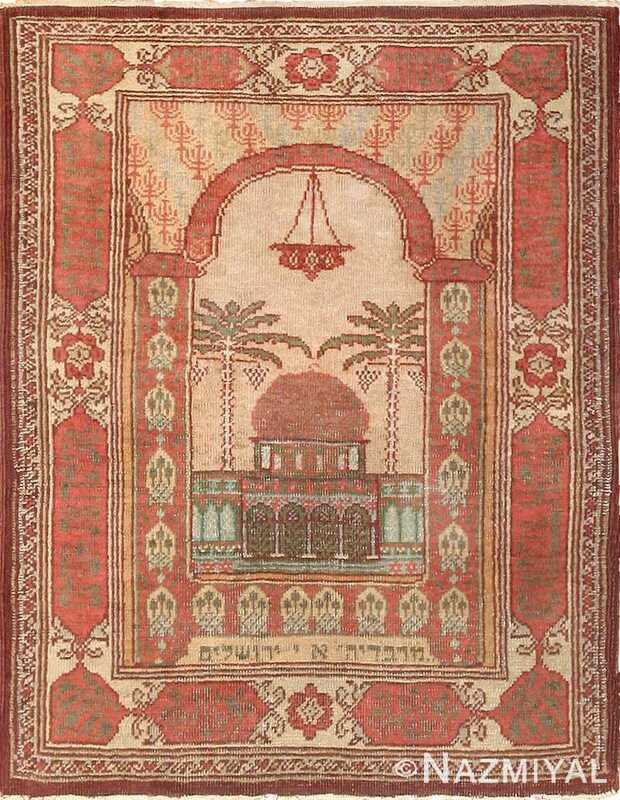 In Jewish matrimonial custom, this declaration is read by the Rabbi and repeated by the groom during the wedding ceremony (while standing under the “chuppah”). 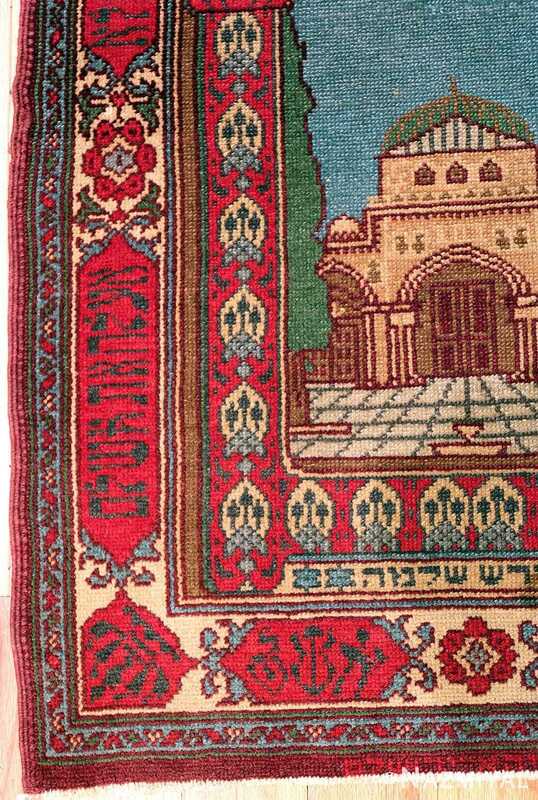 This leads us to believe that this specific antique pictorial Temple Of Solomon Israeli Marbediah rug may have been woven with the intent of giving it as a wedding present or perhaps it may have been an actual dowry gift. 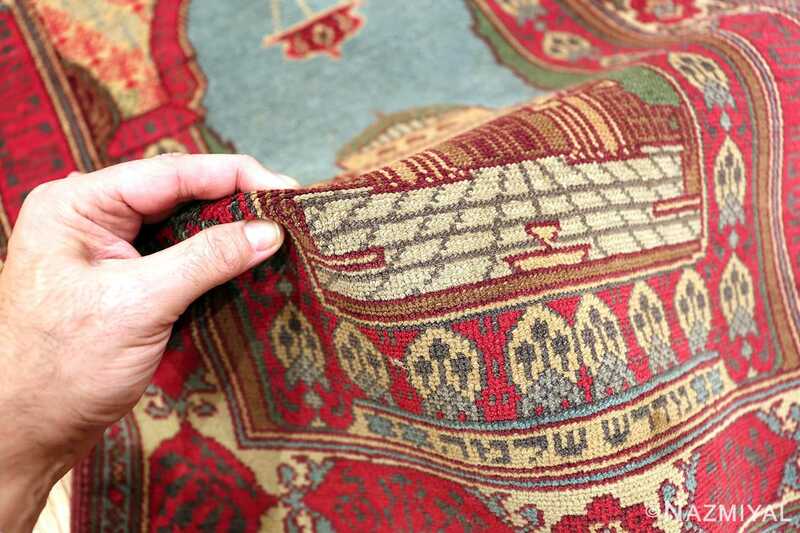 This aspect makes it even more fascinating as it is a true piece of history.